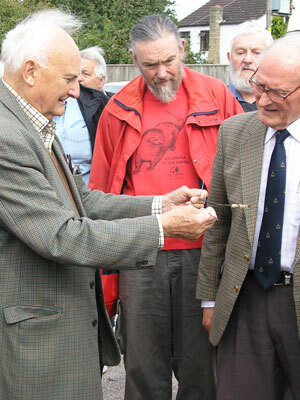 By 10 am on Saturday 22 September, the Slimbridge Village Hall was bulging at the seams. Almost 40 people from far and wide had packed in to hear George Applegate speak. His first big job was at Mere, where the local water board asked him to find the right spot to sink a borehole that could pump 100,000 gallons per hour. That borehole still supplies Yeovil, Sherborne and the surrounding area today. Billy Butlin of holiday camp fame, once contacted George urgently, having run out of water with a site full of unhappy campers. Rushing down to Minehead, George found a contractor on site, ready to begin drilling. He duly dowsed and discovered a good underground supply flowing in from the Brecon Beacons. It was so prolific, the Butlin’s site now sells a million gallons of water per day to the local authority. Dowsing for water in Australia was something of a challenge, where they have had no rain for over four years. There was no grass, the livestock were dying, it was a very serious situation. George organised drilling down to 6,000 feet where they found a plentiful supply of water that was 30,000 years old. “It was quite good,” he said modestly. This modest and charming man delighted his audience with some amusing experiences too. While dowsing in the Cheddar Gorge area, two policemen suddenly appeared and arrested George, convinced he was the poacher they had been seeking for some months. Having no ID on him at the time, George was escorted to the police station from where he was allowed to telephone the Clerk to the District Council, who came and bailed him out. George’s pet hate is dealing with “bureaucrats who don’t know what they are talking about”. He has an assignment in London where finding water has been relatively straightforward, but getting the relevant permissions for various stages has taken nine months so far, and the project still hasn’t got anywhere. George also offers a de-watering service, where he will find out where unwanted water is coming from, and re-route it. He has done this successfully in a skyscraper in New York, a lady’s sitting room in Leicester and in the Severn tunnel near Bristol. Having found water to irrigate a golf course in Japan, hot water for a spa hotel in Bath, and royal water for Prince Charles at Highgrove, George is now turning his attention to oil. As we know, you can dowse for anything if you ask the right questions, and dowsing for oil is quite lucrative. After signing copies of his book for enthusiastic purchasers, George lead the large group out to the car park, where he demonstrated his method of dowsing for all to see.